A properly structured Training Needs Analysis (TNA) can close skills gaps and improve maintenance engineering skills. Using our proven TNA system Engineering Managers can benchmark the knowledge and capability of their maintenance engineers leading to targeted and cost effective business improvements. There are a range of reasons to consider a training programme for maintenance engineers. There may be a demand to increase flexibility by dual skilling or achieve cost savings by reducing the need to call on OEM Service Engineers or that newly installed plant and equipment require new technology skills and understanding. Other reasons might be that the maintenance engineers do not possess the range of skills needed to maintain the plant or that there is a need to reduce the mistakes and assumptions that lead to increased fault diagnosis times. Many maintenance organisations will have faced these issues and recognised that a properly targeted and structured training programme would benefit both the maintenance engineers and the company. A training programme that addresses these problems should be recognised as a management process and be a part of the company/organisation business plan. Successful multi-skill training programmes can lead to changes in organisation culture that can raise expectations and acceptance that development of individuals is an ongoing process. The organisational aspects can lead to improvements in the maintenance workflow systems, validation of competence, reduced downtime and improved OEE figures. The key management component is communication ensuring “buy in” and involvement from all the stakeholders. How should you structure a training programme for maintenance engineers? Maintenance jobs by their nature are varied; they can be simple or complex and challenging, requiring the application of different skills sets and knowledge. Each maintenance employee brings different technical skill sets and capability and it takes time for supervisors to gauge who is capable on what type of job, who is best suited to the detailed precision task and who has the abstract capability to solve the unknown machine malfunction. A properly structured Training Needs Analysis (TNA) package can recognise which skills and competencies are required to maintain the plant and identify where the gaps in capability lie. The TNA will clearly indicate who needs training and what they need training in, ensuring that it is new knowledge and capability that is acquired through the training process. In addition the TNA can inform judgements about balancing skills and competencies across shifts such that the most capable maintenance engineers are deployed where they most benefit the company. The process of creating a Training Needs Analysis for maintenance engineers starts with the construction of a list of tasks that they need to do against who it is that should be able to do them. Typical tasks for electrical, mechanical and instrumentation are listed in the table. Each task has particular requirements in terms of the knowledge and skills needed to perform it safely and competently and this forms the backbone of any TNA. In a similar way a TNA should additionally recognise experience and ability to tackle more complex tasks. An example is that an increasing level of competence would be recorded for an individual with the skills knowledge and experience to capably produce and describe the operation of a PLC ladder diagram with timers and counters than when describing a motor starter circuit. Once the skills knowledge and experience matrix has been compiled, groupings of skills categories can emerge that logically link together to form training courses. 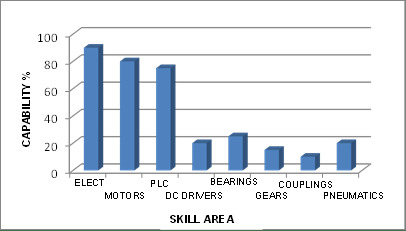 The example graph shows the TNA profile of an individual craftsman with good mechanical skills and some electrical capability. The skills categories/courses are from left to right Bearings, Pumps, Coupling Alignment, Welding, Metrology, Electrical Systems, PLC, Pneumatics, Safety, and Faults Diagnosis. The skills gaps are shown as Coupling Alignment, Metrology and Pneumatics. In summary a Training Needs Analysis requires careful management from start to finish but the gains to the individual and company are substantial in clearly identifying a route where training improves maintenance engineering performance. Call IPS International on 01634 298800 and ask how a Training Needs Analysis can improve maintenance efficiency.